These worksheet are modified from the middle school number relationships and computation curriculum. They are excellent for special education students who require an alternate or modified curriculum. They would also be a good resource for students in elementary/intermediate general education classes. There are two worksheets, one for students who need things more simplified, and one for students who do not. One of the worksheets asks students to circle the correct amount of money that is shown. 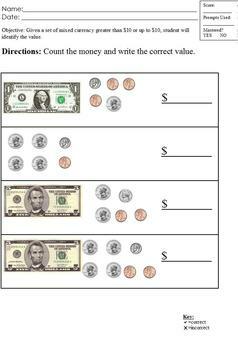 The other worksheet requires students to count the money and write the amount in. There are pictures of the money (both bills and coins) that students can count. Differentiating is painless because the worksheets look very similar. Students will most likely not realize their paper is different from that of other students. 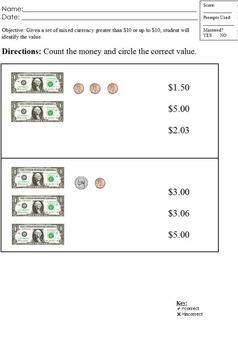 6.A.3.b Given a set of mixed currency greater than $10 or up to $10, student will identify the value.